Britain's second largest city, after London, is often thought of as a busy industrial center with little to offer visitors. Whilst it may be unable to match the charms of many of Britain's grander cities, there is a lot to see and it has a vibrant cultural centre, with an exceptional night life. Born out of the Industrial Revolution, it rapidly expanded during the 19th century into one of the world's greatest industrial workshops. Thousands of trades flourished, especially in metalworking and Birmingham soon made everything from jewellery to pins, buttons and steam engines. Products stamped "Made in Birmingham" became known in nearly every country in the world. The Council House and adjoining Museum and Art Gallery, located in the city centre, was built during the 19th-c, in the Italian Renaissance style. Its clock tower, shown left, has affectionately been given the name 'Big Brum' by local residents - Birmingham's own answer to Big Ben. In the centre of the city is the Bull Ring, a market that has been held since the 12th-c. The current Indoor Market opened in October 2000, replacing the old Bull Ring Market Hall. Birmingham has more miles of waterways than Venice. Its 18/19th century canal system was built to bring water transport into the heart of the city, which comprises several converging waterways; the Birmingham Canal, Worcester-Birmingham Canal, Birmingham-Fazeley Canal and the Grand Union that runs up from London to the Birmingham-Fazeley. These waterways have been carefully preserved to this day. At its peak, in the late 18th-c, hundreds of canal boats a day passed through the city carrying cargo to various destinations in the Midlands and beyond. 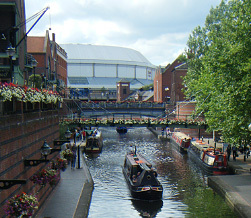 Narrow-boats and cabin cruisers can moor within the city centre. The most popular mooring being the Gas Street Basin, with its many waterside pubs and brightly painted narrow boats. Boat trips on the canals run daily all year round from the Gas Street Basin and from Kingston Row. There are many canal-side walks to enjoy, such as Brindley Walk, Summer Row and Kingston Row. The picture on the left shows a view of the canal from Broad Street bridge, where it passes by the Birmingham Symphony Hall. The white facade of the National Indoor Arena can also be seen in the background. If you enjoy shopping there are many excellent shopping centres in the city, including Broad Street, Western Arcade, Pavillion, Pallasades and the newly refurbished Bullring shopping centre. However, if your looking for a special gift, then a visit to Birmingham's Jewellery Quarter is just the place. St Philip's, in Colmore Row, is Birmingham's Anglican Cathedral. The Church was consecrated in 1715 and become a cathedral in 1905. The designer Thomas Archer spent many years in Rome and the Baroque style of the building reflects his Italian influence. 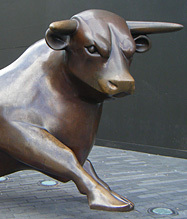 However, the most famous church in the city is St Martin's in the Bull Ring, which dates from the 13th-c. The oldest building in the city centre (other than St Martin's) is the Old Crown House in High Street, Deritend. It is a half-timbered building of the late 14th-c, which was originally a manor house. It is said that Queen Elizabeth I stayed there overnight in 1575.